‘Dance with Twinklesteps’ is a specially developed programme for 3-6 year olds. 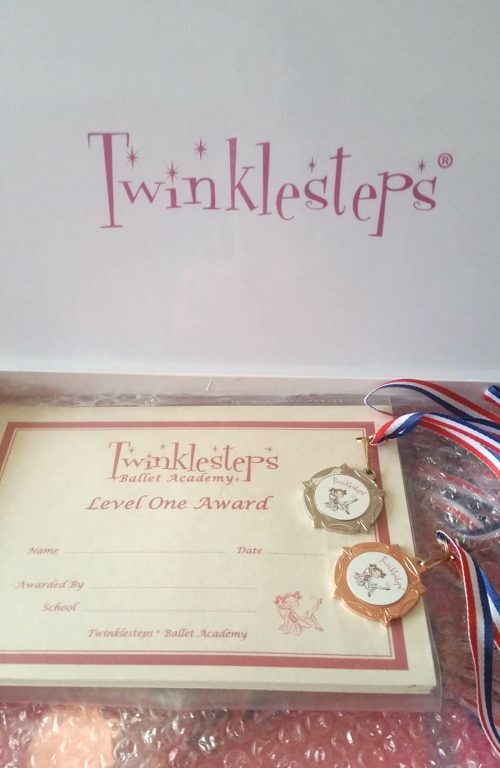 The programme allows licensed teachers to offer Dance with Twinklesteps classes in their area to help children develop a love of dance and music in a fun and imaginative way, as well as developing a good basic ballet technique from an early age. Dance with Twinklesteps is not a franchise so it has the huge benefit of being much more affordable. 70 complimentary custom Twinklesteps’ reward stickers to give out in class (more stickers and reward cards may be ordered if the teacher wishes to use them for their classes). Scroll down for more information about the Dance Programme. 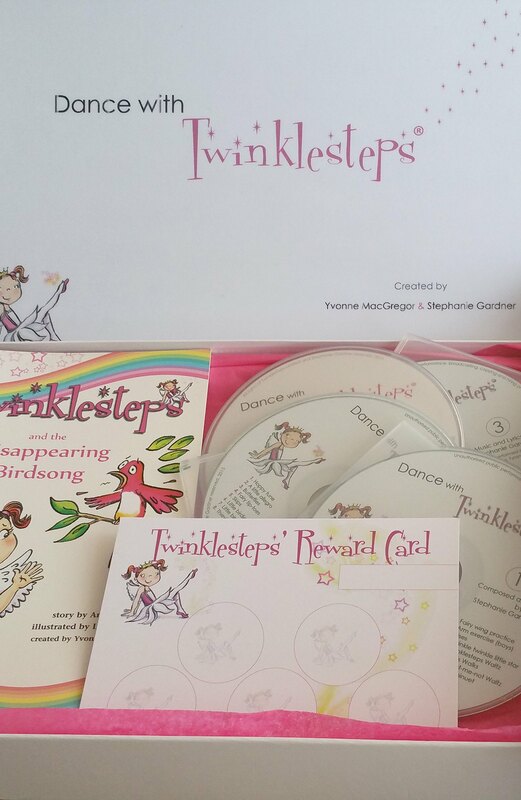 The Twinklesteps Dance Programme is sold worldwide and is currently being used by teachers across Europe, in the USA and Brazil! Please note the Dance Programme is currently only available in English. The programme includes step by step guidance for numerous dance exercises and story centred sequences, covering all basic steps and movements in ballet, appropriate for this young age group. The dance exercises/sequences are set to specially composed music (song and piano pieces of varying styles, moods and tempi), providing an entertaining and educational mix. The Syllabus was developed to be an alternative to an exam class where all children, regardless of ability can enjoy a foundation in ballet. Price includes the dance programme licence agreement for 12 months (£90) renewable to teachers in the UK & Europe at a reduced cost (£80) in subsequent years. UK and EU customers will receive this licence agreement shortly after purchase. We have written and presented the Dance With Twinklesteps programme with the understanding that the teacher has experience in teaching young children and has a strong background training in dance and in particularly ballet. Twinklesteps teachers carefully teach the foundation of ballet technique by following the guide lines in the Twinklesteps syllabus, which uses parallel feet for the very young child. The progression exercises in the syllabus provide a natural and safe development for the children to progress from pre-primary(3+yrs) to primary (6+yrs). Children move on from ‘Dance with Twinklesteps’ with a basic foundation in ballet as well as having enormous amounts of fun! The syllabus is intended to be entertaining but also educational as we aim to encourage a love of dance and music in a natural and progressive way through play, storytelling and imagination. Email Yvonne MacGregor (‘Dance With Twinklesteps’ creator and coordinator) at info@twinklesteps.com if you have any questions about the programme. ‘Dance with Twinklesteps’ is a ballet-inspired dance program that opens new horizons in teaching movement and dance to young children! It offers especially composed music, a dvd with dance sequences and a detailed syllabus – actually everything you need as a teacher to start with your classes! Everything is ready to use in your classes, even if you live in a non-English speaking country. Also, a great resource to use in kids parties! Yvonne is always so helpful and supportive, I’m happy to be teaching ‘Dance with Twinklesteps’ program! We have been following the dance with twinklesteps program in our performing arts school for quite a few years now . We have over 50 children at the moment following the program, and having new enquiries every day about the classes and a big waiting list ! The children love coming to the classes and it’s very popular with our parents too . It’s a fabulous program where the children can use their imagination as well as learn the basics of ballet , it’s perfect for beginners. Yvonne is always very helpful with advice and guidance towards the program. The uniform is gorgeous too ! So glad that we follow this program in our school. I would highly recommend the Twinklesteps programme – not only do the children love it but the parents do too! The brand has been a big influence on parents choosing our classes which has been a massive help in terms of running a business. On the other side of things, the music and activities with the characters has been brilliant for classes and all the children get so excited about their ‘adventure’ when they come to ballet class! I would highly recommend this programme of study 🙂 Yvonne has always been so helpful and has so much passion for the programme it comes across in all the communication she has with you and will do anything to help! Thanks for being brilliant!